Animation has traditionally been used to tell stories that couldn't be told using live actors, or at least to tell the stories in ways that live action can't. The birth of CGI effects tore down much of that distinction. The kind of impossible action that you could only see in high production anime series suddenly became possible to recreate with real actors, as shown in the Matrix. 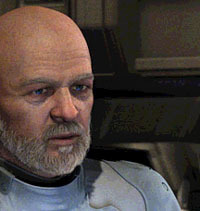 Star Wars Episode 1 showed that completely CGI characters could become as real as the flesh-and-bone actors. Traditional animated films, like Atlantis, or Osmosis Jones, use CGI effects to add a sense of movement and detail that traditional cel animation can't provide. In either case, CGI is being used to expand the possibilities of the medium, and as technology improved, the goal is to have the CGI become invisible, so that whether we're looking at fantastic submarines or Gungans, the reality of the world is never compromised. In the original ending, Aki was pregnant with Gray's child. Final Fantasy: The Spirits Within is a bizarre film and unique in Hollywood, not because it is the crowning achievement of CGI FX or of 3-D animation, but because it marks the theatrical debut of another genre: the game cinema. Square has been the leader in creating cinematic cut scenes (matched only by Blizzard in the US). Like the categories above, the goal of Square (and any other game developer with any sense) has been to use CG animation to seamlessly expand the possibilities of the medium. As game hardware and software advances, the lines between game cinemas and in-game graphics have blurred to the point where cinemas are often rendered on the fly. After games like The Bouncer, Parasite Eve, and Vagrant Story, you can tell that Square, and FF creator Hironobu Sakaguchi, have been itching to create the truly interactive movie. Before they can make an interactive movie, they decided to prove that they could create an entirely artificial movie. "In making the game series, I had always wanted to go further with the storytelling aspect," Sakaguchi said. "In the games you have to read the text dialogue to get the story, but with this level of detail, a character's expression, even a single gaze, can deliver as much information as many lines of text." This is definitely true, but cannot the same be said about cartoony characters like Buzz Lightyear? Of course it can. But if there's one thing that Square has shown over the past decade, it's that technology for technology's sake is of the utmost importance to them, as evidenced by their abandonment of Nintendo and partnership with Sony. Sakaguchi is one of the greatest storytellers in the gaming world, if not in all entertainment, but as all the recent episodes of Final Fantasy have shown, his priority is to advance the visuals of the game over the gameplay. So the hyperReal characters of FF:TSW are a natural extension of his philosophy towards games. Sakaguchi was quite frank about what led him to make this film the way it is. "The drive to do this is the same as what drives people to climb mount Everest- because it is difficult and because people say it can't be done. 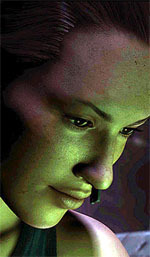 If you ask computer graphics artists, they'll say that realistic, or hyperReal characters, are the Holy Grail of CGI. So I was aspiring to that." Peri Gelpin was impressed by the large gift baskets that square gave the actors. Fulfilling this dream proved quite a challenge for Square- before they could make the film they wanted, they'd have to create the technology to do it. And to create a film of this scale would take more support than even the biggest game developer in Japan could provide. Chris Lee, former exec for Columbia/Tri-Star remembers the day that Final Fantasy fell on his lap. "I was working at Tri-Star in 1997 when Jun Aida came to me with a 12 page treatment for Final Fantasy, saying that he (and Sakaguchi) didn't just want to make a movie, but the first digital movie with all digital characters." Setting up shop in a brand-new Honolulu studio, Square Pictures was born. Using Maya software from Wavefront Digital, the FF team created a short clip to showcase the technology and raise funding. "Compared to what we can do today, it was quite horrendous," said producer Jun Aida. "It'll probably show up on the DVD," Chris Lee chipped in. 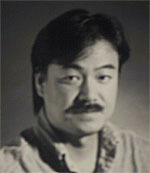 Describing the genesis of the film, animation director Andy Jones had this to say: "Sakaguchi said he wanted to push reality, he wanted to make the people as real as possible, but we both knew that we couldn't make completely believable photo real people so we stopped at a place where we were both satisfied, and he said to make the movie in that world." It's true. The characters in Final Fantasy never look real, and no one involved in the film will try to tell you that they do. That' s not the point. What they do look is consistent with the rest of the film's world. "This is a very digital summer. You have Shrek, Osmosis Jones, this film, but you also have Mummy, and where would Pearl Harbor be without its digital effects? Cats and Dogs could not be made with out digital technology. We have this weird summer where there's no Mel Gibson, no Tom Hanks, no Tom Cruise, and yet it's the biggest summer in Hollywood history. Digital technology has become inescapable as a tool in telling these big stories," said Chris Lee. "And yet, I think CGI is being overused by filmmakers. Compared to a movie that's half live action and half CGI, like Mummy 2, I think our version, where everything is CGI, looks better." Donald Sutherland: "My wife went to the screening with me and looked at Dr. Aki's bum and said, "she's not real." 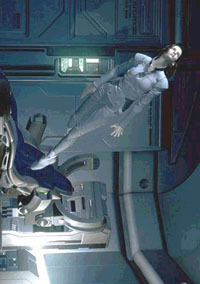 Even though Chris Lee, with his Hollywood background, likes to focus on the cinematic potential of the CGI film, the film's other producer, Jun Aida, is more aware of the film's importance to Square's overall goals. "We're a subsidiary of a very successful game company, and through creating this new animation studio in Hawaii, we created more sophisticated technology that we can use in the next generation of video games, such as FFX on PS2." Final Fantasy fans will see more of this technology's potential in the DVD release of the film next spring. The first release will be a standard DVD film, but several months later, Square is planning a PS2 exclusive version that allows the watcher/player to change camera angles, adjust lighting, even change the action in the film. "In the (PS2) DVD you'll see the characters doing completely different things than they did in the movie," Chris Lee hints. Of course, what would a Final Fantasy title be without a great story? For fans of the FF games, bits of the film's story will seem quite familiar. Sakaguchi admits the similarities "The underlying theme of this story you can also find in FF VII & FF IX, so it is not entirely unlike the games." 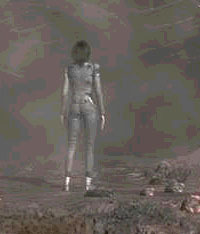 It was Sakaguchi's trademark spirituality that attracted the actors to the project. Peri Gelpin, who voices the tough-as-nails marine Jane, isn't normally a fan of science fiction. "But I loved the message of the film. I love the idea of respecting the earth and that we're all connected to it." Donald Sutherland, the voice of Dr. Sid, was also drawn into the project, not because of the technology, but because of the theme. "I love this film. It's about the life energy that we have to respect... like Whitman or Thoreau." A lot of science fiction films attempt to weave in some sense of spirituality, but few are as earnest as FF:TSW. Animation Director Andy Jones is most proud of his work on Dr. Sid. Fans of Final Fantasy games who are disappointed by the first film's science fiction setting need not worry about the future of the franchise. "There will not be a sequel to The Spirits Within," says Jun Aida, "but that doesn't mean there won't be another Final Fantasy movie. The next one will be a unique story, created by Sakaguchi, just as all of the games are unique." Square Pictures isn't actively working on any new projects (at least none that they'll admit to), but they are looking at other Square games to adapt to the screen. "I'd love to do Parasite Eve, or a something with a fantasy setting," says Chris Lee. 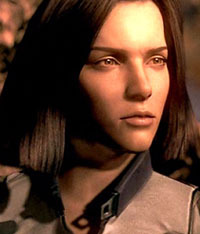 Even though moviegoers will never see another film with Dr. Aki Ross, they might very well see her likeness in other CGI films. "Sakaguchi wants to take Aki Ross and put her in another movie as a completely different character, maybe change her haircut, her hair color," Chris Lee says. June Aida is quick to add, "Maybe we should giver her a ponytail and save millions of dollars." They could do this with other characters as well. "We have them all saved on computer." You might miss the Chocobo, but try not to miss Sakaguchi's cameo appearance in the film. In their attempt to create as realistic a world as possible out of CGI, perhaps Sakaguchi and Square have shot themselves in the foot. The feels so "real," that after a while you stop thinking about it as an animated film and look at it as just a science-fiction story. The awkward dialogue and inept humor become more apparent (unlike in the games, Sakaguchi can't rely on silly super-deformed faces to carry the humor). The settings and the action scenes, despite their technical perfection, come off as tired and cliché. Even the aliens, despite their very unique designs and fascinating origin, come off as Alien-esque bogeymen. But, then, this is Final Fantasy we're talking about. "The first Final Fantasy was made as my final attempt to make a game that sells, as I'd made a lot of games before that, but not of them had caught on. So this was to be my final swansong, and if it didn't catch on, I was going to stop game making forever," Sakaguchi says. 20 games and a feature film later, Sakaguchi's still on top. If history is any indication, the Fantasy isn't coming to a Finale any time soon.